Google Adwords case studies: we currently have 12. Any agency or media owner can submit case studies to our team and these 12 are the strongest we have received, with the most recent case studies at the top of this page. If you're interested in more digital marketing case studies then review our complete case study library. If you're interested in submitting case studies then email our case studies manager to find out more CaseStudies@DigitalTrainingAcademy.com. Vodafone used structured snippets in Google AdWords to improve ad relevancy, sees click-through rate increases of up to 100%. How does a small luxury car rental business stand out from the crowd in a crowded market? This case study looks at how PT Wahana Indonesia Transport used Google AdWords to increase sales by 50% and expand its business. Scottish butcher’s Macbeths revamped its keyword strategy last summer and saw a large jump in our sales and ROI, increasing order rate by 50% in one year. 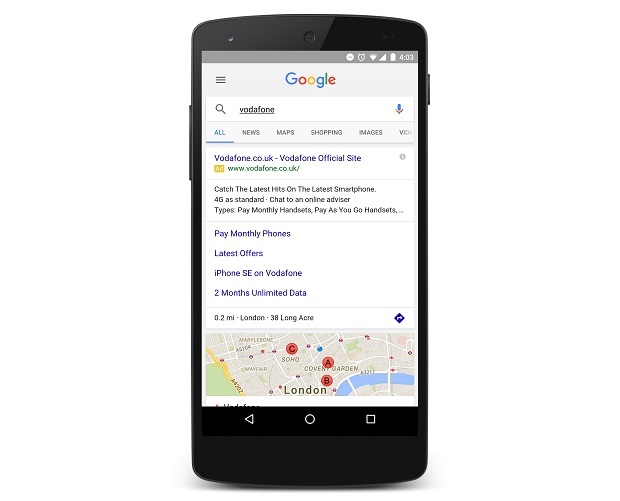 This case study looks at how a local business can use paid search to beef up both sales and customer numbers. Targeting fat-fingered typists across the UK, this clever search campaign from Snickers used misspelled words in Google keywords to capture hungry office workers’ attention during the working day. This case study outlines how the chocolate bar brand managed to reach 500,000 people within just three days of launch, without any seeding and for less cost than bidding on brand keywords. In April 2013, Finance site MoneySupermarket.com saw its search ads pulled from Google's search results due to a ‘lack of transparency’ over its payday loan adverts. Google pulled all paid search ads run by MoneySupermarket.com as part of a crackdown on payday loan vendors that disregard AdWords’ policies. The ads were down for over 24 hours before the issues were rectified by MoneySupermarket. The move also saw MoneySupermarket ads for car and home insurance removed from the rankings for 24 hours. In February 2013, Interflora disappeared from the front page of Google’s natural search results, fuelling speculation that the florist has breached the search engine’s guidelines. The flower delivery service's home page fell off the first page of Google's results when searching for the term 'Interflora' and ’Flowers’ (see screen shot above). Google refused to give a reason for the block, but did cite ‘webspam‘ in its answer to queires. 1-800-FLOWERS.COM used mobile advertising to drive traffic and incremental orders and create competitive advantage. The campaign used Google’s AdMob platform to run a sponsored link on mobile search results, telling customers that they could purchase flowers and gifts from a mobile device even at the last minute. The campaign resulted in 2 million mobile impressions, driving traffic and incremental orders. CTRs were 2-3 times higher than the Google desktop based campaign. Net Support, a software development company from Peterborough, UK, needed efficient and cost-effective marketing to expand into new markets in North America, Asia and the Middle East.. To achieve this goal they began by targeting relevant inventory in international markets on the Google content network. It developed this strategy by launching rich media advertising created by Google Display Ad Builder. As a result they achieved 15-25% conversion rates on the Google content network, 1.5 million+ impressions per day on the content network and saved design costs on creating individual image ads. Cumbria Automobiles (www.MotorParks.co.uk) in the UK needed a marketing tool to drive their expansion in tough economic conditions. To achieve these goals the company invested in Google AdWords to promote new dealerships and utilised the the reporting on Google Analytics. As a result, MotorParks.co.uk quadrupled its market share and helped fuel exponential growth of new dealerships. Golden Pages, a household directory name in Ireland for over 40 years, was in need of efficient tools to help manage their directory of products and services as well as client accounts. To resolve this problem, the company began using the new Google AdWords interface. The effect of the implentation of AdWords meant greater convenience and time saved, with improved navigability and interactive graphs. Ambergreen, a digital marekting agency based in Edinburgh, UK, needed more efficient management of AdWords accounts. To address this problem they began exploring the new tools and functionalities of the new Google AdWords interface. The result was clear as significant time savings were made along with improved account management effectiveness for Ambergreen's range of blue chip clients. Search marketing works for every type of firm and every size of business. 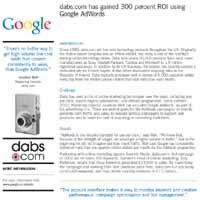 We’ve worked with the team at Google to select these case studies to help marketers see just a few of the ways that pay-per-click search engine advertising can drive traffic to your site. PPC search marketing is key to getting more customers and building traffic to your websites. You can download the case studies here and explore them in more depth on The Search Academy training courses.